If we focus only on MEDLINE® citations (publications indexed with MeSH, Medical Subject Headings) the number of publications each year is increasing exponentially. 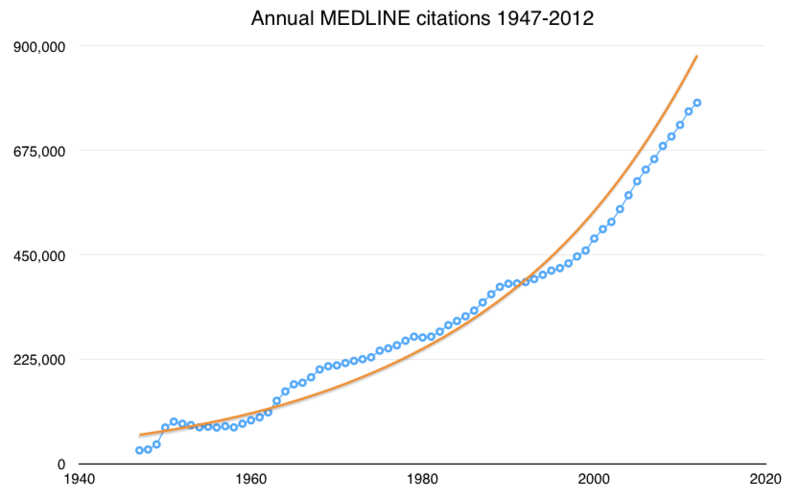 The graph below shows annual (not cumulative) MEDLINE® citations. The trendline in orange highlights the challenge of staying-up-to-date: annual medical publications is not just increasing, its accelerating. Sure, the vast majority of these have little relevance to your or my practice, but even within critical care specialties the volume of new research is overwhelming. Anesthesiology, critical care medicine and emergency medicine each have around 30 specialty-specific journals (and for EM that's excluding toxicology, for which there are more than 80 journals!) – that's around 10,000 specialty-specific published articles every year for each specialty – and more than 25,000 unique articles published annually for all critical care specialties. Pause for a second. 25,000 publications. That's almost 70 every day. Almost 3 every hour. One new critical care related publication every 21 minutes. That's insane! Even if you decide to follow only the top five journals that are most impacting and relevant to your practice, plus throw in a couple of your favourite general medical journals (NEJM, Lancet, BMJ – ), you will need to watch for more than 150 new articles every month or around 2,000 every year. Almost all of these will be neither personally relevant or impacting. A personally-significant piece of quality research is probably just as likely to be published in one of the 25 specialty journals that you don – t watch, as it is in one of those that you do. Even if they appear among your followed journals, even if there are five truly relevant articles each month, you must find them among the more than150 that grace your mailbox, inbox or department library. At best, keeping up to date with evidence that is relevant to your practice by following a few select, even high-quality journals is hit and miss. The problem is not the sheer quantity of research to keep up with, because most of those articles are not significant, personally relevant or of sufficient quality to individually merit a change in practice. The problem is finding the 0.1-0.2% of 25,000 articles each year that do meet those criteria for informing your practice. It's no longer 'publish or perish' – it's publish and perish without knowing why.